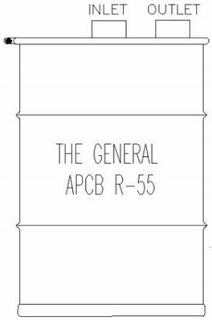 The General R-55 adsorber is a ready to use, low cost, self-contained air purification unit. It is constructed from epoxy-coated mild steel with PVC internals for corrosion resistance. Four inch (4″) inlet/outlet connections and a radial flow air distribution pattern allow it to treat airflows of up to 500 CFM. Activated Carbon – The General R-55 adsorber is filled with virgin, high activity activated carbon. Other virgin coal, coconut shell, reactivated or impregnated carbons are also available. Connections – Standard 4″ female pipe thread fittings are located on the lid of the drum. Unions or quick connect fittings are advised to make drum exchange easy. Flow Distributors – The R-55 barrel uses a central slotted pipe to insure even distribution of the airflow through the carbon bed. A vertical duct system collects the air and directs it to the exhaust port. Installation and Startup – The General R-55 requires no special procedure for startup. Just connect the inlet and outlet to the rest of your treatment system and start it up. A typical installation has multiple units connected in series. A sample port should be located between the units so that periodic testing can be done to determine when the first unit needs to be changed out. Maintenance – Once connected, The General R-55 requires no maintenance other than the monitoring of the influent and effluent air streams and the operating pressure of the system. Monitoring the air stream into the last R-55 in series mode is the recommended safeguard against having breakthrough in the final discharge. When the concentration of contaminants in the outflow of the lead unit equals the concentration in the inflow, The General R-55 has reached its removal capacity and should be removed from service. The working life of each adsorber is dependent upon the type of contaminant in the air as well as its concentration and the airflow rate. A pressure relief device is advised to prevent damage to the canister in the event of excessive pressure buildup. Recharging The General R-55 – Once the unit has reached its capacity, it should be removed and replaced with a fresh unit. To purchase replacement carbon or to arrange for a carbon change out, please contact our office. FIRE! When vapor phase activated carbon adsorbs chemicals, a heat of adsorption is given off. The treated air flow is the only way this heat is removed from the bed. If the chemical concentration is high and the gas flow is small, the heat created in the carbon bed can accumulate to the point where a bed fire is started. In addition, if you are dealing with flammable chemicals, understand the correct operation of your system. If you have any questions about the fire potential of your system, please call General Carbon Corporation at 973-523-2223.